Welcome to Johnson’s Appliance Repair, LLC! We look forward to welcoming you as a customer. We want to be your preferred source for home appliance repair services, in the greater Grand Rapids MI area, now and in the future. When searching for a reliable and reputable appliance repair company in Grand Rapids MI – you have many options. From larger companies with management teams and lots of technicians – to smaller family-owned companies with just a few employees. We, at Johnson’s Appliance Repair, LLC, fit the latter description. And that is just the way we like it! Take a look at Our Team page to see exactly what we mean. One of the main reasons we choose to remain just a small company is to ensure that we provide the very best possible quality service in the appliance repair industry in our area. We take customer satisfaction very seriously and we strive to exceed all customer expectations – no matter what the job is! 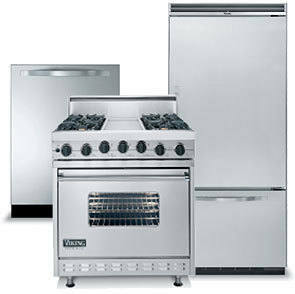 We service most major brands and types of household appliances. Please call today to get started with your appliance repair! After many years in business, we’ve built up an impressive collection of testimonials and reviews. Please take a minute to read through some of our testimonials. All of these were written by real customers who actually used our service and felt strongly enough about it to take the time to leave a review! We appreciate every last one and look forward to many more testimonials just like these. We get SO excited when a new testimonial is submitted and our website guy eagerly publishes them as soon as possible. As a Thank You for finding us on the web and taking the time to look through our website – we would love to offer you an exclusive discount! Take a look at our Specials page for simple instructions on how to get our exclusive discount. Hint: all you have to do is mention it on the phone when you call to set up your appointment! Contact us today to discuss your options and set up an appointment.